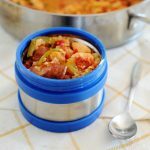 After years of enjoying classic jambalaya, I think it’s due for a low carb makeover and thanks to cauliflower rice, this healthy jambalaya is mission accomplished! Thankfully, making low-carb jambalaya isn’t hard to do, swap the regular rice for cauliflower rice, use a leaner sausage like chicken sausage, and voila! Easy, delicious and healthy jambalaya. Using pre-packaged cauliflower rice might save you a couple of minutes, but it’s actually really easy to make your own. I have a video on how to make cauliflower rice three ways which you can watch below or read about how to cook cauliflower rice here. ﻿ This recipe is a real crowd pleaser, and every time I make it even the die-hard jambalaya fans don’t have a problem asking for seconds. It’s that good. 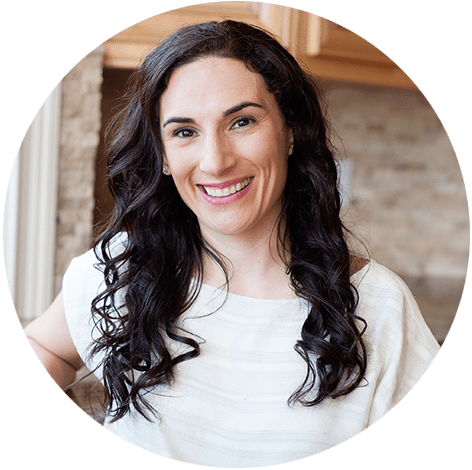 Making low carb jambalaya is a major relief for anyone doing paleo, grain-free, or low carb, so I made sure to include it in my Family Kickstart, a meal plan designed help families ditch the “junk” and eat fresh. Think of it as a Whole30 but for the whole family. Needless to say, it was a major HIT! For a free peek at Family Kickstart and how you can enjoy eating clean as a family go here. It’s 100% kid approved. The original Jambalaya recipe is very hearty and jam-packed with flavor. It uses regular rice, andouille sausage, and a combo of chicken, and/or shrimp, making it a popular recipe for dinner and large crowds. Another main ingredient in Jambalaya is the Creole seasoning, a basic spice mix commonly used in Louisiana and other Creole dishes like gumbo or blackened fish. It’s great for seasoning meat before it goes on the grill, burgers, pasta, and more! You can make it yourself, I’ve included my recipe below, or order it off Amazon! Jambalaya is one of those recipes that can be made ahead and tastes better the day after. I like to double the batch, enjoy some for dinner and reserve the leftovers in meal prep containers for up to 3 days, after that it should be frozen and eaten within 2 months. 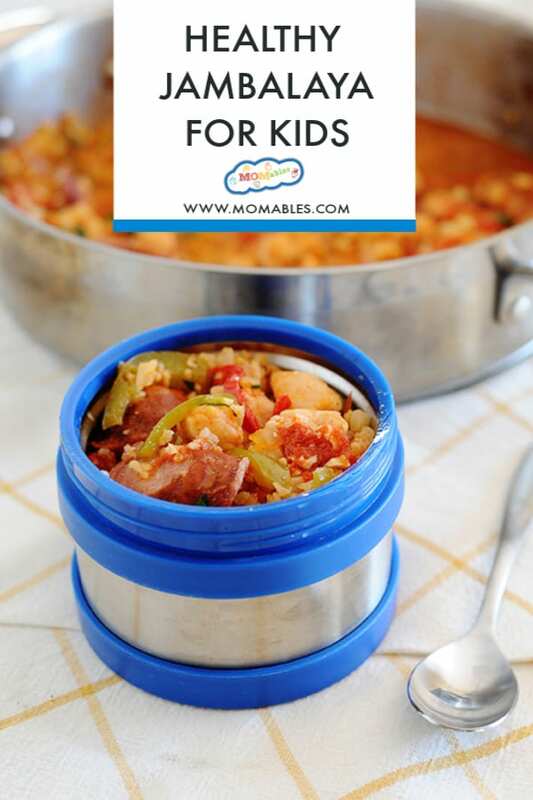 To pack for school lunch, reheat and transfer the leftovers to a thermos container. If you’re on the lookout for a good thermos, check out these here. I’ve had mine for years and they’re still going strong. You can either reheat jambalaya in the stovetop or microwave, whichever is more convenient for you. If using frozen jambalaya, make sure to allow it time to defrost before heating. I can’t wait for you to try this and don’t be shy, tell me what you think! In a medium bowl, combine the chicken and seasoning and gently toss. In a large skillet, set over medium-high heat, heat the coconut oil. Add the seasoned chicken and sausage. Cook for 3 to 4 minutes stirring frequently, until the chicken begins to brown. Add the bell peppers and red onion. Cook for 2 minutes more, stirring frequently. Add the tomatoes, breaking up any large pieces with a spoon. Stir in the cauliflower rice. Cover and cook until the chicken is no longer pink and the cauliflower rice has absorbed all liquid. Remove from heat and serve. In a medium bowl, stir together all of the ingredients. Store in an airtight container for up to 3 months. Easy, no-bake lasagna is the perfect mid-week dinner for busy families!